I saw this sweater party on the Green Eyed Monster's blog and I wished that I was invited. It looked like such an amazing time and then I thought to myself, why don't I throw one? So I did! I invited some crafty ladies over to my house for a Sunday brunch and wreath making party. Each woman brought 3-5 felted wool sweaters that we then cut up and shared with each other. 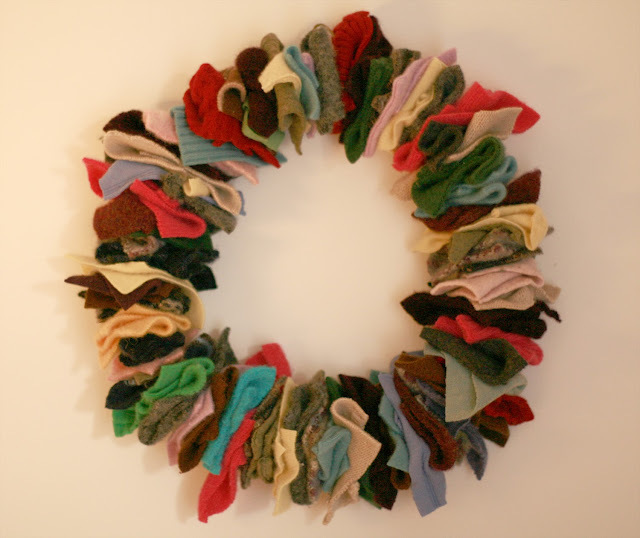 Thankfully we had enough wire coat hangers for some folks to make more than one wreath, if they were so inclined. I served this yummy banana pumpkin bread and this easy cheesy potato spoon bread dish along with mimosas, it wouldn't be a CocktailMom event otherwise. I'm hoping to throw more of these crafty brunch parties, it was such a great way to spend the day. What should we make at the next crafty brunch? Share your ideas in the comments. This was so much fun. The food was great.